DeWalt Max Fit screw driving bits are the perfect way to maximize your DeWalt power tool system. Featuring the 10x Magnetic Screw Lock Systems, the Max Fit bits are ideal for use in impact drivers and drill/drivers. Each bit features a precision-machined tip for ideal fit in screw head recesses, resulting in less stripped screws. The Magnetic Screw Lock System holders and sleeve feature a floating ring magnet for fastener retention. The DeWalt DWA2509-12IR RAPID LOAD 12-inch Spade Bit Extender With Screw Lock takes the hassle out of reaching and drilling holes in wall studs and ceiling joists. The 12-inch extender is built impact tough, and features a quick release rapid load adapter that fits all 1/4-in hex shank spade, drill, and driver bits. Built for impact drilling durability. 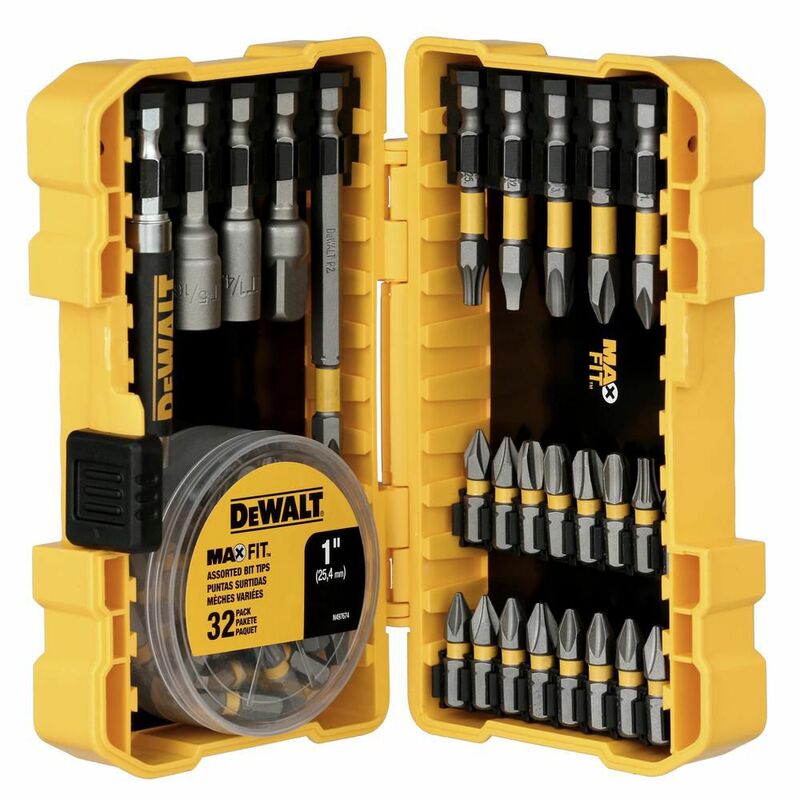 Featuring heavy-duty titanium pilot points that start on contact and helps to prevent walking, the DEWALT Titanium Drill Bit Set includes commonly used bits for a range of metal and wood-drilling applications. No-spin shanks helps to prevent bits from slipping, and a tapered web delivers helps to increased durability to helps to reduce breakage. A durable carrying case keeps bits organized and ready to go. DEWALT FLEXVOLT High Efficiency Accessories are engineered to maximize runtime. The hole saws feature a self-feed pilot bit for fast, efficient cutting, carbide teeth for long life, and a thin Kerf design for high efficiency. For use in cordless and corded tools. MAXFIT Screwdriving Bit Set (60-Piece) DeWalt Max Fit screw driving bits are the perfect way to maximize your DeWalt power tool system. Featuring the 10x Magnetic Screw Lock Systems, the Max Fit bits are ideal for use in impact drivers and drill/drivers. Each bit features a precision-machined tip for ideal fit in screw head recesses, resulting in less stripped screws. The Magnetic Screw Lock System holders and sleeve feature a floating ring magnet for fastener retention.